The United States benefits from an extensive and sophisticated wildland fire response organization composed of thousands of separate local, state, tribal, and Federal entities. Each organization has specific responsibilities for responding first to wildfires occurring within their jurisdiction (initial response). They also coordinate and share resources and responsibilities as fires become larger and exceed the local response capacity, requiring a more extended suppression response. Fortunately, local response capacity is generally adequate for controlling or extinguishing most wildfires, though escalating risks due to changing conditions in and around communities may impact response effectiveness in the future. Such preparedness does not come cheap; Federal expenditures alone in 2005 to 2013 exceeded on average $1.6 billion dollars per year. The relatively small percentage of fires that escape initial response are vitally important, as they account for a disproportionate percentage of the area burned, damage to homes and communities, and injuries and fatalities. For example, a summary of available data shows that the top 3 percent of fires in terms of individual fire sizes account for over 90 percent of the total area burned nationwide from 2002 to 2011. Another way of viewing this is that if an additional 1 percent of the fires in the United States were to reach the size of the current top 3 percent, the total area burned would increase by 30 percent. Relatively few large fires also account for a major portion of total suppression costs nationwide, and the variation in large fires from year-to-year results in significant swings in total suppression expenditures. This variability creates major challenges from both a planning and funding perspective. An effective and safe collective response organization is essential. Response is the last line of defense and action, coming after fires have started and there is little recourse. As with any large, complex endeavor, there are opportunities to increase efficiency (i.e., use resources to maximum advantage). Finding ways to contain large wildfires more efficiently is an ongoing and continuous struggle and an area of active research. Possible solutions generally include combinations of resources, organizational or administrative adjustments, and tactics. An additional avenue to improving efficiency is to match response efforts with other management options. For example, response personnel will find it easier to protect homes and communities when those same homeowners have proactively reduced hazards around their homes and prepared for wildfires. Coordinated response is a complex nationwide issue. Multiple institutional arrangements have been negotiated and developed across the country to meet the challenge of delivering the appropriate resources and personnel required on each incident. The RSCs and others examined various ways of improving coordination within their regions and have suggested actions for improvement. Implementing these recommendations will require working through the details among the various national, regional, and local governance organizations. Analyzing the full implications of these multifarious recommendations is beyond the scope of this report. Several of the data sets that the NSAT accumulated could be useful within forthcoming regional and local discussions of these issues. At the national level, it is possible to highlight patterns that suggest areas of greater concern, or alternatively where a combination of response with other policy options might play out differentially. Figure 3.15Because large wildfires cause significant challenges, it is important to know where large, long-duration wildfires are likely to occur and plan accordingly. Normative terms like “large” and “long-duration” are context-dependent. For example, a large fire in the intermountain West may imply thousands of acres, whereas a fire exceeding a few hundred acres in New England would be unusually large. Identifying a national standard that reflects these nuances is difficult. 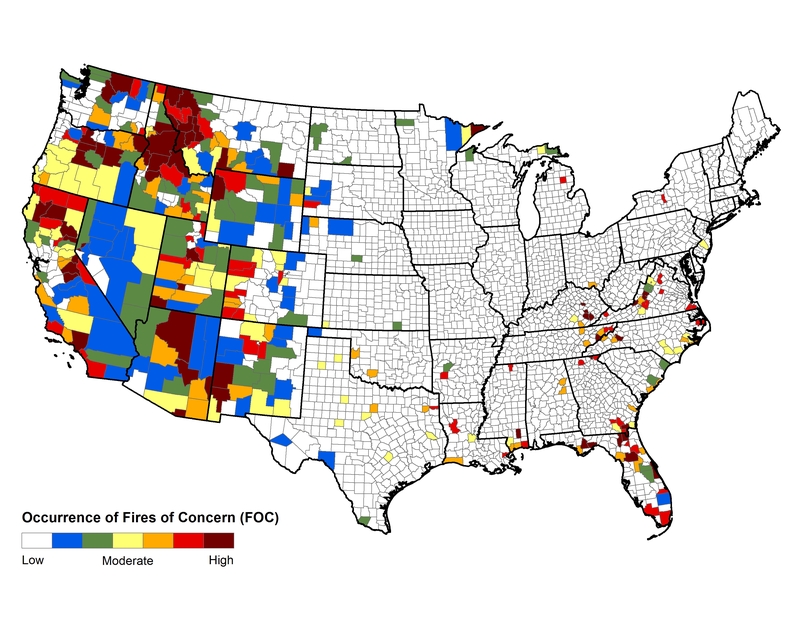 For analysis purposes, we defined an index of fires of concern (FOC) as being greater than 1 square mile in extent and at least two weeks in duration (from report to containment). The two standards work in tandem. Larger western fires tend to be constrained by duration; fires lasting more than two weeks are generally much larger than 1 square mile. In the eastern United States, the size constraint ensures that long-duration fires are of consequential size. The 10-year record of events (2002 through 2011) shows higher frequencies of FOC in drier western counties, coastal areas of the Southeast, the southern Appalachians, and the upper Midwest (figure 3.15).